This past Saturday we traveled to Ohio State to see the Penn State Blue Band and Ohio State Marching Band in an epic B1G band match-up during the biggest game of the weekend. Truly words can't do justice to the performances that both bands gave. We were able to attend Skull Session which is a pregame concert that features the bands about two hours before kickoff. The arena is packed with band fans and alumni and boy were they in for a treat. The Penn State Blue Band is known for their concert band-esque performances. They never shy away from tough arrangements of classical music and this show was definitely not the exception. The band's show was titled "Night at the Opera" and featured Pagliacci, the Overture to Candide and Elsa's Procession to the Cathedral. The band is under the Director of Greg Drane and it is clear that they have locked into his vision for the band. 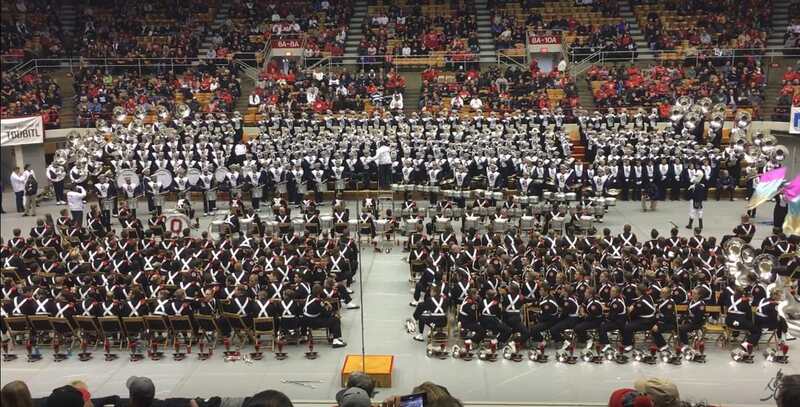 We spoke to a number of TBDBITL alumni and fans after the performance who all mentioned that this performance may have been the best visiting band performance they have seen in the last few years. Listen to the recording at the end of Pagliacci, you can hear some alumni say "whoa" after the last note. Even members of the Ohio State band told us how awesome they sounded. It takes a lot to impress the Ohio State band and their fans, but Penn State walked out of Skull Session having made a lasting impression on everyone in the arena. Enjoy this incredible performance by the Penn State Blue Band during their visit to Ohio State. Well done Blue Band! We are looking forward to seeing what you do the rest of the season. If it's anywhere near as good as this we are in for more special moments.